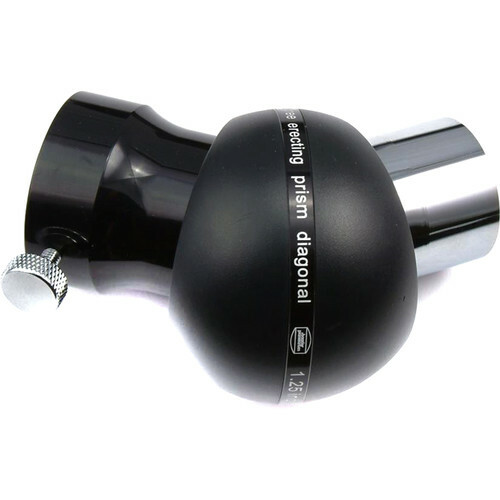 The Alpine Astronomical Baader 1.25" 45° Amici Erecting Diagonal is the ideal addition to your accessory kit for low-to-medium magnification celestial and terrestrial observations. The standard-size 1.25" holder and nosepiece are compatible with the most common size of focusers, eyepieces, and other accessories. Its over-sized erecting prism has anti-reflection multi-coatings on the exterior surfaces to maximize light transmission, while highly reflective coatings on the interior prism surfaces virtually eliminate diffraction—resulting in very little light loss through the prism system and ensuring views remain bright and clear. The prism size produces a generous 24mm clear aperture to prevent vignetting, while it corrects the view horizontally and vertically so it can be used to observe earthbound subjects in refractors or Cassegrain-style telescopes. To improve views the nosepiece is threaded to accept standard 1.25" eyepiece filters. Due to the optical limitations of the erecting prism system, the Amici is not recommended for high magnifications as you may experience color fringing and other aberrations. Box Dimensions (LxWxH) 5.2 x 4.0 x 3.7"